Audi has demonstrated their vision for how we'll defeat the darkness on the roads in the future, introducing innovative new laser light technology that is three times as powerful as LED lights at CES 2014. 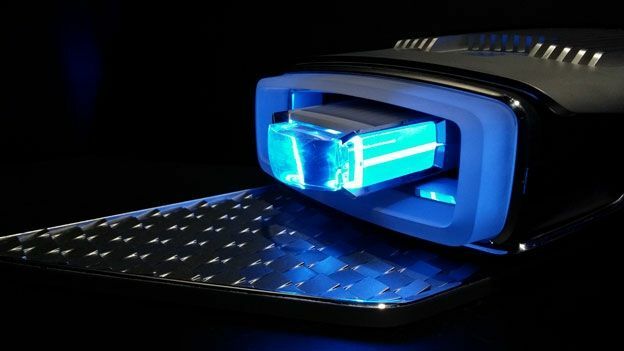 The German car manufacturers took the covers off their new laser-powered lights which boast an output of 1,200 lumens, almost double the range of standard LED high beams. They will be the first company to put this laser technology into production with the system one day replacing LED lights across their range. The new lighting system outputs beams that are three times stronger than LEDs with beams capable of reaching distances of over five football fields. Laser diodes emit a monochromatic and coherent light with a wavelength of 450 nanometers. In its natural form it has a bluish shimmer. A phosphor-coated film in front of the diode converts it into a white light suitable for automotive applications. Just a few millimeters in diameter, the laser diodes are even smaller than LED diodes and come very close to the theoretical ideal of a high-output, point light source for use in cars.